The stag knew I was there. He could smell me but it didn’t discourage him. He stood at the mouth of the cave and roared. I was inside the bell of his voice, the cave ringing with it. It was dark, but there was moon enough to mark the shadow of his antlers on the floor, and I could see the shapes of the hinds passing, hear their hooves drumming the path. The stag muttered, begrudging me, then strode off, following the hinds up onto the slopes of Breabag. All afternoon I’d sat at the entrance of the cave and watched the deer in the glen: small groups of hinds, their heads bowed, yearlings at their sides, grazing the autumn grass; to each group a stag, lording it over them. October is rut month, and the glen their rowdy amphitheatre. The stags have bulked up from summer and a coarse ruff of hair bristles on their necks; they’ve rolled in soiling pools, coating themselves in thick, black peat, and chewed on mosses and lichen until they smell rank. One stag I was watching, with his hinds on the slope opposite, began to bellow as another stag approached, crossing a boundary. They hurled themselves at each other, the bone-clack of their antlers sounding clean and dry like a gunshot in the glen. With brute strength, driving the intruder backwards, the resident stag defended his estate. I didn’t come here for the rut. In a month of walking, I only knew that I wanted to soften boundaries rather than define them. I circled west and north to the mountains of Assynt; in the company of Canisp, Quinag, and Cùl Mòr, I felt my body loosening, as though I’d removed a coat that was too tight. The cave system at Creag nan Uamh, ‘the crag of the caves’, has been forming for hundreds of thousands of years, water patiently dissolving the limestone seams. Excavations, early in the 20th century, unearthed brown bear and reindeer bones. Later digs revealed the remains of arctic fox, lynx, wolf, and wild horse. A found fragment of polar bear skull is 20,000 years old. People were here too, at least as far back as the Neolithic. Old sheilings by the stream below the caves are a reminder that, until recently, we were integral to the ecology of the glen. Our removal, just another small, harsh deed in the history of land ownership in the Highlands. The nearest village now is the crofting township of Elphin, ten miles away. Light faded from the glen as the sun dropped behind Canisp. Two ravens returned to roost on the crags, complaining at my presence. The hinds had crossed the stream and were cropping grass below the cave, the stag herding and strutting as though it were he who’d made the decision to cross. I didn’t come here out of crisis. I simply wanted a break from the responsibilities of parenthood, marriage, employment; a month where I didn’t have to be a useful, solid citizen. It felt timely, I’d turned 50 and my children were teenagers, beginning to shape their own lives; and I’m lucky, my wife and I both understand the gift of solitude. I was surprised how little I missed those I love, though it wasn’t for lack of care; rather, I found my sense of who I was shifting, as though I’d become pliant with the land I was walking through. Where I could, I avoided roads and houses, the jolt of tarmac and people, anything that demanded a hardening of my own form. When I ran low on supplies, I veered towards a town or village, bought what I needed, and left again. I’d planned a simple, healthy diet, but I’m no ascetic. Early on in the walk, having crossed the Monadhliath mountain range in the Central Highlands, I limped down into Fort Augustus with a blistered heel. I went straight to the shop and stocked up on treats, then rested for four days on the shore of a quiet loch, camped amidst pine and birch wood, feasting on bacon and eggs and dark chocolate digestives. At night I drank malt whisky by the fire and tended to my heel, impressed by its weeping. In the mornings I swam in the loch, my pale, Scottish body turning bronze in the peaty water, as though it was no longer mine. Four of the caves at Creag nan Uamh can be explored on foot: Badger, Reindeer, Bone, and Fox Cave. Beneath them, and the slopes around, lie systems of passage and chamber accessible only with climbing gear, including a cavern that could house Edinburgh’s Usher Hall. Bone Cave slanted down and in for 30 feet. At the back was an alcove with a clear pool. Ripples, reflected by my torch, danced on the ceiling as though the water was glad of the light. A low passage, opposite the pool, narrowed to a port hole – a child’s squeeze – through to Reindeer Cave. The passage was sheltered and quiet, away from the wind at the entrance and the noise of water dripping from the crags. I unrolled my mat and sleeping bag and lit three small candles. Reindeer antlers form the bulk of the animal remains found during excavations of these caves, having been washed into them from the slopes above. Carbon dating reveals that reindeer were here as early as 50,000 BCE, when glacial ice was advancing and receding across the glens. In a study of several hundred of the antler finds, the overwhelming majority were from female reindeer. The few others were from immature males. Reindeer are unique amongst cervids in that both male and female carry antlers. Adult males shed theirs in winter, adult females in early summer at calving time. The females seek high, remote terrain for calving. They return again and again, in large herds, to the same grounds. Yearling males will occasionally accompany their mothers, but no adult males will be present. For thousands of years, it seems, the reindeer of Assynt used the slopes above Creag nan Uamh as their calving grounds. I was camped in a cave that had become an ossuary for their remains. These are fragments, folk memories of the complex and sacred relationship between hunters and their prey, observed in all traditional cultures. In a study of the Yukaghir people of Siberia, the anthropologist, Rane Willerslev, provides a contemporary account of that relationship. The parallels with the Scottish tales are uncanny; they share a way of seeing the world, and an intimacy between human and animal, that is easier for us in the modern West to dismiss, than it is for us to understand. The stag at the cave mouth startled me out of a thin sleep. After he and the hinds had gone, I lay in the dark with my eyes open. I thought of moments in my life when civilisation, and its expectations, felt like a weapon pointing at my head, as though, to survive, I had to find a form acceptable to it. Here in the Bone Cave, I’d dropped out of its sights, slipped furthest from the form of me that is husband, father, tax payer. I lit a candle and looked up at the ceiling of the passage, pitted and ribbed like the roof of a mouth. The distance between me and the people and the houses of the village of Elphin was more than ten miles. 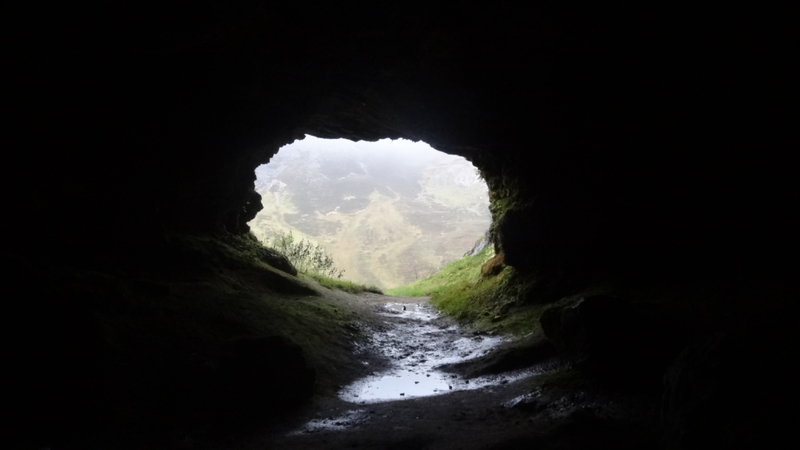 The morning was cold and damp in the passage at the back of the cave. In dim light, I brewed tea on the stove while still in my sleeping bag. Outside, the stags were bellowing at a distance, further up the glen. I know that we’re out of kilter, that the reindeer are gone, and the wolf, the lynx, and the bear, though they’re remembered in place-names: there are local names that refer to mathain, ‘bear’; and north of Breabag, below the peak of Conival, lies Coire a’ Mhadaidh, ‘the corrie of the wolf’. I know that the red deer, who remain, are stunted, living on poor land, their numbers kept high by estate owners so that wealthy men can shoot them, with none of the intimacy and respect of a Yukhagir hunter, or of Muireach Mac Iain of Badenoch. I know that over-grazing by the deer continues to strip these glens, where once they would have been thickly wooded. A story collected in the 19th century is prophetic: a hunter is returning from Beinn a’ Bhric in Lochaber when, at the foot of the mountain, he hears a sound like the cracking of two stones, or the rattling of a stag’s horns against a rock. He sees, crouched by a large stone beside the path, the semblance of a woman with a green shawl about her shoulders, and in her hands a pair of deer-shanks, which she strikes, one against the other, without ceasing. The hunter asks: “What are you doing there, poor woman?” But the only reply she gives is: “O’n loisgeadh a’ choille, o’n loisgeadh a’ choille” – “Since the wood was burnt, since the wood was burnt”. She keeps striking the bones, again and again, until he walks out of hearing. It was a grey, wet day. I packed my rucksack and climbed up onto the stone fields of Breabag. The deer on the hill appeared to be just deer, though the path I was following wasn’t just a hill walker’s path to the summit; it was another path, drummed by hooves; an old path, leading to the birthing place of reindeer. Below me, two ravens were in the air above Creag nan Uamh, reclaiming it after my intrusion, descendants of descendants of the ravens who once watched over these calving grounds, attending each birth, eager for the bright, wet afterbirth. I picked my way along the summit ridge, across quartzite slabs and patches of loose scree, heading north towards Conival and Ben More Assynt. Up here, after so long an estrangement, all traces of the reindeer have been scoured away; there are no layers of sediment to act as an archive. But place holds memory in myriad ways. Kneeling in the rain amongst the scree, I looked for and found a form of lichen, delicate and curled on the rock, known in Gaelic as crotal rèin-fhiadh, ‘reindeer lichen’. This is an extract from Dark Mountain 14. Republished here with thanks to author and publisher in solidarity. You can buy it here. Reading this in the middle of London, I feel drawn into nostalgia for a world unknown to me, for I am a lowland Scot. Yet, the wildness of the mountains , the grandeur of the stag, and the sense of animal life speaks to some sort of inherited memory. A relative Cate MacDougall did come from Ballahulish, eloping to Glasgow in a horse and cart, and visiting Applecross, near Glencoe, recently I felt fearful vibes and think this is because the Thomsons are said to be a sept of the Clan Campbell who massacred the MacDonals at Glencoe. Anyway, whether or not, I really felt this piece drew me into my Scottish roots. Thank you. Is this all the Highlands is? Landscape? Animals and killing them? I wouldn’t compare today’s lovers of killing with any kind of traditional hunter from any ethnic background. This piece sounds like a very modern fetish to me, and the links to human culture, if they’re meant to be mutually definitive, are a little sinister given the history of what the shotgun-carrying classes did to the human Highlands, and the way today’s Wild Lander “conservationists” (of everything non-human), many of whom are of the same non-Scottish origin, are now threatening to finish their work. You write that you “wouldn’t compare today’s lovers of killing with any kind of traditional hunter from any ethnic background”, and that would be a fair point if by ‘comparing’ Dougie was likening – as if they were similar – today’s deer hunters in the Highlands with the ways of hunting of the the Yukaghir people of Siberia. I don’t see that he is doing that at all. He is comparing in order to show the huge contrast (not the similarity) between them. So, is Scotland encumbered with immature males who have not gone through a biological rite of passage leading to maturity via responsibility?